SculpSure St. Lucie – Melt Away Stubborn Fat with No Surgery, No Downtime! Now Get your Second treatment of SculpSure Free! For a limited time, we will double your fat reduction at NO ADDITIONAL COST to you by adding a second round of treatments free! This promotion is only available at New Radiance Cosmetic Centers! New Radiance is the #1 SculpSure Center in Florida. With our Advanced Protocol and the second round of SculpSure treatments FREE, we will get rid of twice the fat, maximize skin tightening and give you the body you desire. SculpSure St. Lucie – SculpSure is a completely non-invasive FDA approved Laser treatment for fat reduction and skin tightening without surgical incisions, anesthesia or downtime. SculpSure is the most effective non-invasive technology to date for eliminating fat from the body without surgery. Clinical trials proved that one treatment of SculpSure results in almost 25% fat reduction. Fast and easy treatment with up to 4 applicators allows us to simultaneously treat separate areas. Two treatments and we can eliminate up to 48%! SculpSure has been hailed by the media as a “game changer” and is the top non-surgical fat reduction treatment to date.1. Radiance was one of the very first centers in the United States with SculpSure and since that date we have become one of the Top 5 SculpSure Centers in the United States! Thousands of SculpSure treatments later we have now become the ONLY facility in Florida with the Advanced Protocol for enhanced results to stimulate lymphatic drainage, maximize fat loss and provide additional skin tightening. With this protocol, additional treatments are performed after SculpSure to maximize results – an additional $1,100 value which we provide at no cost to you. Our results are therefore the best you can expect anywhere! During 25 Minute treatment, 4 applicators treat 4 areas simultaneously. Sculpsure™ is a safe and effective way to lose troublesome fat and is FDA approved 1. 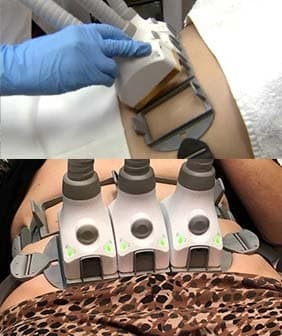 A breakthrough in body contouring and it is now FDA Approved 1 and available in St. Lucie. FDA Clinical trials have proven that SculpSure is effective at eliminating fat cells by specifically targeting and damaging fat cells which then are absorbed by the body. Even with diet and exercise, most people have stubborn pockets of fat that seem impossible to lose. SculpSure’s body contouring technology is able to target and destroy these fat cells in just 25 minutes without affecting the skin’s surface. Over time, these damaged fat cells are naturally absorbed and removed from the body, with results seen as quickly as six weeks and optimal results typically seen at 12 weeks. No Downtime, No Surgery, No Anesthesia. 4 applicators treat up to 4 separate areas in 25 minutes. Additional treatments may be performed in only 6 weeks. Also Interested in the ALL New Next Generation CoolSculpting – Click Here! These images show the applicators at work when applied to your body.